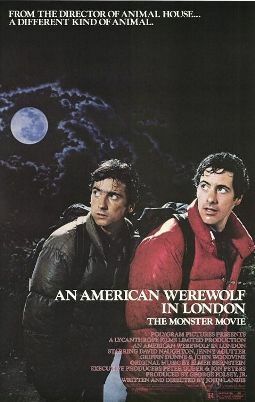 Welcome to John Landis’ An American Werewolf in London, a very fine (and very timeless) piece of lycanthrope cinema. Two American backpackers are sightseeing in some far-flung reaches of Yorkshire. Tired and hungry, they come upon a pub called The Slaughtered Lamb, whose denizens are not the most welcoming sort. In fact, our heroes David and Jack, feel like they really don’t belong, and it’s not just a cultural thing. The place is a bit sinister. One of the barflies tells the two young men to “stay off the Moors.” They pay for their drinks and bounce quickly, heading into the dark night. Suddenly, a creature of the night tears at the them. Jack is mauled down to his flayed skin. David wakes up in a London hospital with quite the tale to tell, yet nobody at Scotland Yard is interested in hearing it. He does, however, have a friendly ear in nurse Alex (Jenny Agutter). The two hit it off, but David is starting to exhibit strange feelings…especially come full moon. An American Werewolf in London is one of those rare species of horror film, one with comedic elements that work exceedingly well to complement the bloodiness. David Naughton is exceptional as the wide-eyed American. Rick Baker’s effects are one-of-a-kind. Join us every week on the Really Awful Movies Podcast, as we discuss our favorite genre classics, predominantly horror. Subscribe!